I was honored to receive word a week ago that my art quilt, After the Storm, has been accepted into the 2017 Sacred Threads exhibit. I have always loved the Sacred Threads exhibit. It is held bi-annually in Herndon, VA. 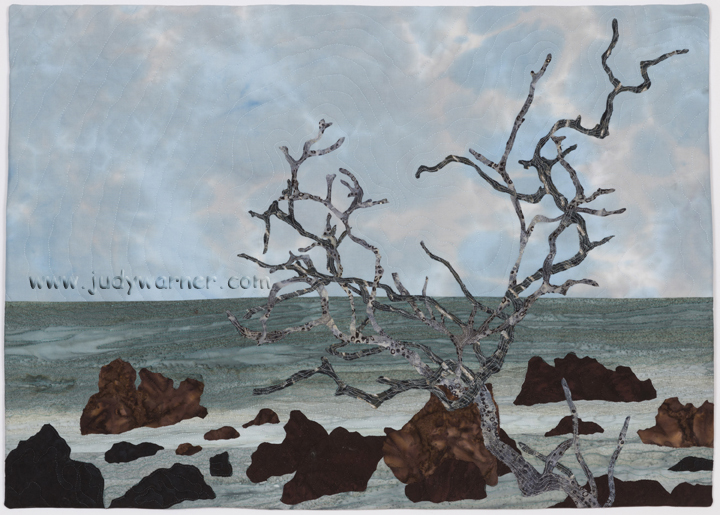 The website for the exhibit describes its purpose as “a positive influence on the human spirit, giving joy as well as addressing concerns of the soul and mind.” In my journey as an art quilter, I immediately flagged the exhibit as one that I would love to be part of. I have been fortunate to have been previously accepted into the 2013 and 2015 exhibits. My 2015 contribution, JOY!, has been part of the Sacred Threads traveling exhibit. After the Storm depicts a scene on the Hana coastline of Maui in Hawaii. It had been a day of torrential rains. We had been on a day long tour of the coastline and had pulled over near a viewing point. The remnants of some branches that had blown against some rocks caught my eye. The sun was just beginning to break through the clouds. I entered After The Storm into the exhibition under the category of grief. For me, the broken branches reaching out and seeming to pierce the skyline represented emotions of angst and pain that I have felt in my life as friends and family have passed on. The sky, beginning to clear, served as a reminder that life goes on. The 2017 exhibition will be July 7-23 at the Floris United Methodist Church in Herndon. If you are in the area this summer, it is an exhibit definitely worth seeing. In the meantime, I am linking to Nina Marie Sayre’s Off the Wall Friday blog so you can see what other artists have been up to this week. Hi Judy- Ohhhh this is lovely!!! Great job! This is a wonderful work to have accepted. Congratulations, Judy! I feel the same about Sacred Threads.. it is a special venue to be a part of! Congratulations, Judy. You have an eye for seeing the beautiful in life. Thank you. Congratulations! It is a moving beautiful piece – so glad others will be able to enjoy it.